Fingerling potatoes, so named because they resemble fingers. These small, waxy, narrow, elongated potatoes typically range from 2 to 4 inches in length. 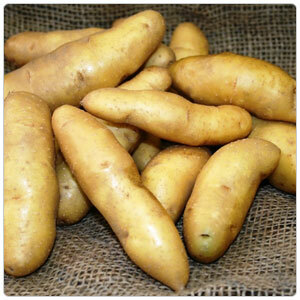 Fingerling potatoes come in a variety of colors, from pale yellow to red to purple. Fingerlings have mild to nutty flavors. Some varieties of fingerlings are hundreds of years old. These potatoes cook more quickly than larger types, maintain their shape well when cooked, and generally create an aesthetically pleasing plating. Great for roasting, deep-frying, baking and grilling. Use in salads, gratins, and soups.